Sushi Mieda, this is possibly the smallest Japanese restaurant in town, and is a collaboration with renowned one-Michelin star Japanese Kaiseki Masterchef Nobumasa Mieda, who is based in Hokkaido, Japan. Situated on the 10th level of the OUE Tower, Sushi Mieda is an 8-seat epicurean masterpiece that stands out as a one- of-a-kind dining experience. Helmed by Chef Keisuke Ohno. Creating perfect sushi dishes comes under Chef Ohno’s forte. Originally from Miyagi, Japanese – born Chef Ohno was lured into the culinary world when his passion for this industry and for food was recognised at an early age. Chef Ohno prides himself on using the best and freshest ingredients. Each dish on his menu is conceptualised and executed with exacting standards. 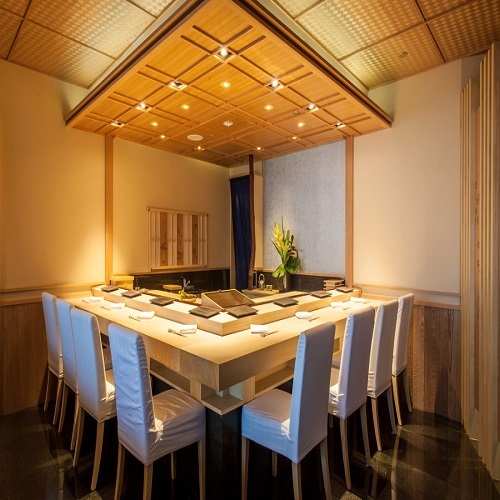 Should you prefer an alternate dining experience, Tóng Lè Private Dining (which serves Premium Chinese Cuisine) provides alfresco dining and private room bookings, which naturally also serve Sushi Mieda’s stunning creations.